"So Good to See You" Wire, "Siesta" Smooth. Center: "Dreaming of Tomatoes" Long. 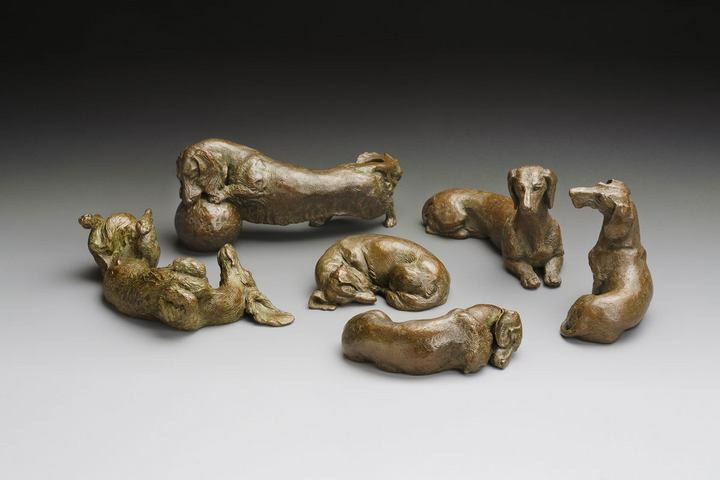 This little group simply shows how one might display their family of bronze dachshunds, or how to create an instant collection of 1:6 Scale Miniatures! Here, dachshunds are shown in a variety of coats. Mix and match to your pleasure. If you wish to have a sculpture in a coat I haven't made, simply commission me to make the piece! Shown in the Toad patina, all are also available in Black & Tan patina. Each bronze is signed and numbered out of its own edition. Each is made by hand in Colorado, USA, and each includes my mark, . Pieces may be commissioned in Smooth, Wire or Long coat. Bronze photography by Mel Schockner, except as noted.